ConfigMgr OSD does a great job of injecting drivers ‘on the fly’ into your OS Deployment process. For example, you can create task sequence steps with conditional statements to apply drivers for a specific model. That’s great for your standard build, but how do you handle those one-offs, those non-standard builds? Here’s a process that you can you for those non-standard builds, or for that hardware that you’re testing, but haven’t quite committed to being a standard yet. All we need is a vbScript, raw drivers, and an additional step in your task sequence (haven’t tested with MDT, but should work there as well). The following process ONLY works on Windows 7 and Windows Server 2008 R2. If there is enough demand, I’ll create a similar script for previous Operating System versions. Step 1 – Create a USB folder with raw drivers for the desired hardware. Copy desired drivers to this folder. You can create subfolders to help with organization if you’d like. Please note that *everything* in the ExportedDrivers AND ALL SUBFOLDERS will be processed, so try to keep the folder structure organized, and to ONLY include the desired raw drivers. We have a few extra folders here to keep things organized, but you can just put them in the root of “ExportedDrivers” if desired. Download ImportCustomDrivers.txt, and rename to ImportCustomDrivers.vbs. 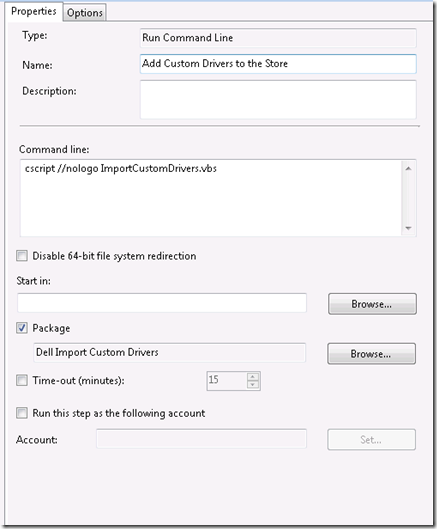 This step should run in WinPE, just before all other “Apply Driver Package”or “Auto Apply Drivers” step. Depending on your environment, you may want to enable the ‘continue on error’ checkbox on the Options tab. If the script attempts to import a driver that does not apply to the current operating system, it will return a failure exit code. 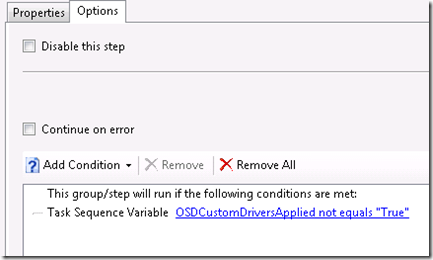 If you have ADDITIONAL “Apply Driver Package”, or “Auto Apply Drivers”steps, and you want to skip these steps if we import drivers from the USB, enter a conditional where Task sequence variable “OSDCustomDriversApplied” not equals “True” (this variable is set in the .vbs when it runs). Now that you have your task sequence configured, insert the USB drive into the test system and launch a test build. At the “Add Custom Drivers…” step. you will see a command prompt that shows the status of the drivers that are being injected. The log files will also be copied to the ConfigMgr log file directory to allow for post-image troubleshooting. Again, this process is meant for those one-off scenarios. If you plan to fully support a platform, be sure to handle driver installation using ConfigMgr driver management. 'enum each drive letter, and see if strDriverFolder exists in the root. Log vbTab & "Connecting to SMS.TSEnvironment"
Log vbTAB & "Unable to connect to Microsoft.SMS.TSEnvironment"
Log vbTAB & objDisk.DeviceID & "\" & strDriverFolder & " Exists, Importing drivers.."
Log vbTAB & "Setting TS Variable OSDCustomDriversApplied = True"
stroutputlog = strSystemRoot & "\temp\SMSTSLog\OSD_CustomDrivers.log"